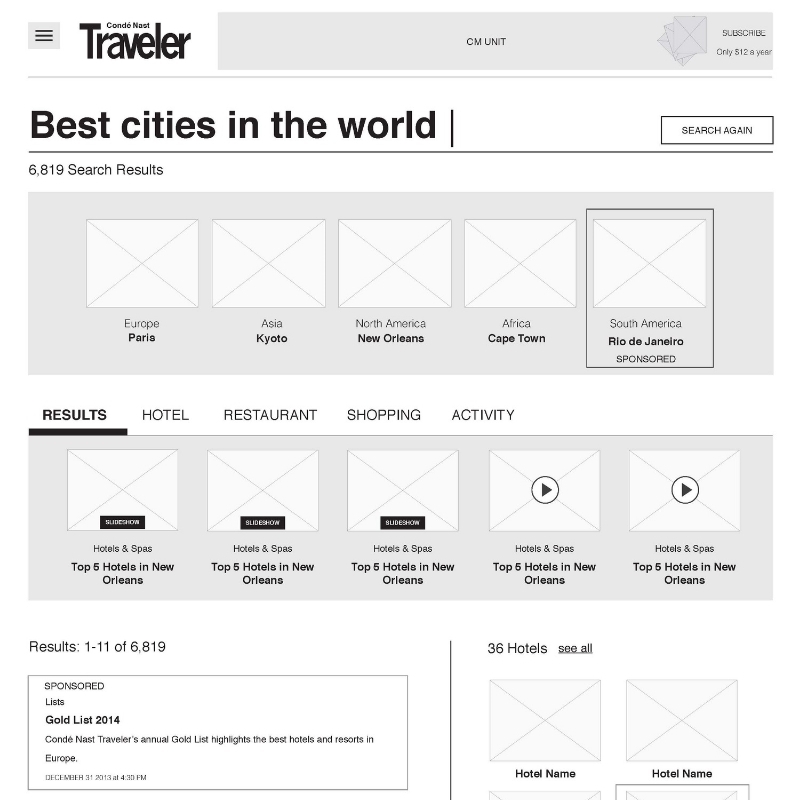 The core of Condé Nast Traveler website redesign is moving beyond travel to lifestyles. In this case, the search experience, a really important factor for the site, is supposed to represent this concept not only in interactions but also in visual design. What do users really want to get when they are typing these keywords? The design breaks down several use cases, and repackages the results based users' different needs. There are several scenarios that users search for content on CNTravel.com: they are looking for travel inspirations, specific cities in their minds, or detailed advices like where to stay or eat. Based on these use cases, the concept of the search experience design is to create different layouts that fit users' needs. There is a search filter function that users can browse results by content groups, like the editorial results, or the related hotels, restaurants, etc. The Hot List, Gold List and Reader's Choice awards are unique editorial content of Conde Nast Traveler. The search experience is a good place to promote these packages to users as travel inspirations.